Hey everybody. Welcome to today’s podcast or blog or video, wherever you are digesting this content today. My series is based all around the lead generation for real estate agents. 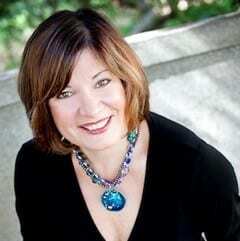 Today we are lucky enough to have my good friend Laurel Starks on the call today, the nation’s foremost expert in the divorce real estate niche. As a veteran REALTOR®. She has completed over a hundred and $50,000,000 in sales. What is Divorce Real Estate? She’s the author of the house matters in divorce, a 2016 Inman innovator and 2017 Inman influencer. These were all related to her pioneering work in divorce real estate. Her latest and arguably most meaningful endeavor yet is the launch of the Divorce Real Estate Institute (coupon code: Ballen) which she founded in 2017. She did this to educate and support real estate agents nationwide and building a divorce real estate business and serving their local family law communities. This is her specialty. This is what she does. This is what she’s great at and that is why she is here today to share with us. Speaker 1: It’s where a real estate professional is utilized for the purposes of handling the real estate transaction in a divorce. That includes selling the property. There are many different aspects of a case in family law, as you can imagine. You’ve got custody issues that need to be sorted out. You’ve got financial issues that need to be completely divided. There can be businesses when someone is going through a divorce that need to be also dealt with. Family law attorneys and the court are very accustomed to employing and using experts in those respective fields. Family Law attorneys are generally not experts in real estate. They utilize, on a consistent basis, and have for decades, the use of child psychologists to make recommendations to the court with regards to child custody and making sort of custody arrangements. They utilize business valuators to assess and value businesses and then make recommendations and report. They also utilize forensic accountants to go through and figure out financial and tax consequences of dividing assets. One thing that the family law community has never truly had is a real estate expert to handle the proper discovery as well as advice and sale of the family residence. There are many people who are getting divorced throughout the country who are not well informed. They are making decisions based on a lack of information and possibly a lack of competency with the professionals that they’ve got in their life that they can come back and sort of bite them or at least at the very least, not set them up for success. What I have done and I started doing 13 years ago when I got into this business, the very first listing that I ever sold was a divorce. And from that point on, I made this my complete niche. I have become a divorce real estate expert, a court-appointed expert in my community and sort of pioneering here what that looks like in my area. It is my passion to take what I’ve done here and the effect that I’ve been able to make on my local family law community as well as a community of divorcing clients and teach other REALTOR®s nationwide how to do that in their communities as well. There are multiple processes going on simultaneous. It’s important to have a REALTOR® who understands how to navigate through and cope with the legal and the emotional aspects that affect that of the family residence. Speaker 2: 07:47 I can imagine the emotional aspects because I’ve experienced it at both as a real estate agent who was working with a couple getting divorced and as a person getting divorced and there was a lot of emotion brought into the process. In fact, we just got a referral not too long ago for that, for a couple that was getting divorced and, and immediately thereafter they wanted to switch to a different agent on my team because the male doesn’t want to another male or the female didn’t want another female, whatever. We’re going to talk about how we lead generate for this in a moment, but who do you think would do well, do you believe in this type of a niche? Speaker 1: First and foremost, it is, it’s a REALTOR® who understands real estate. So that is sort of a basic, basic foundation if you will. There needs to be a very comprehensive understanding of, of real estate and that is from real estate contracts to the real estate process and knowing your market very, very well. The agent should know how to market a property. It’s all of these things that a top-notch REALTOR® should know before diving into a divorce niche. One needs to have a very firm grip on real estate itself because this is a very complex and dynamic niche to lay on top of what is already real estate expertise. Assuming that’s done then is really someone who can balance compassion with effectiveness and get a job done and who does not get wrapped up into, into the emotional piece of the case. It’s someone who knows their place and can sort of corral two people who are very emotional, who mentally disagree with one another and who can be neutral and then corral them to behave in such a way that the, that the sale can go through essentially. It’s someone who is compassionate. You know the disc, right? So it needs to be someone who has a “D” if you will, who can take the authority that is needed. And, like I said, balancing that with, with obviously the question. So it takes, takes some emotion. Somebody with a good emotional balance as well as has a good grip on real estate and someone who’s open to learning. This is really a very all-encompassing niche. Speaker 1: This is certainly not something that is a sort of a fly by night. A lot of times I get contacted by agents that have been licensed for years and years that need help. I’ve been contacted by REALTOR®s nationwide for years on can we have a quick phone call, how do I do this? It’s really a lot more than that. This is really a profession. It’s so important to understand that this is something that requires an ever-evolving skill set. I’m constantly still going to classes, learning how to refine my skills in this niche. Speaker 1: It is definitely all shapes and sizes. Sometimes. We do have cases where the house must be sold and it must be done immediately and there has been a court order and they are ready to go. This needed to have been done yesterday. I’ve got cases right now that I have been working with for many, many months before it finally comes to a point where they’re ready to move forward with the listing and the sale of it is. I would say most of the time, these are not quick. There’s a gestation period when it comes time to actually selling the house. So long as the agent is skilled, these things should sell and be handled in pretty much the same amount of time as a regular listing would in terms of time on the market. You can assume that it is double to triple the amount of time that an agent actually puts into the divorce listings before the home is listed. In terms of how long it takes to actually get the home sold, it really should take the same amount of time that a traditional listing takes so long as there’s good control of the situation. Speaker 2: OK, good. Now let’s talk about lead generation. So how did you stumble into this niche or did you purposely go out, go after this? I was a flight attendant for 10 years, so I did not have any sort of a legal background or any sort of a deep-seated real estate background. I came from a completely other industry and, and got into this real estate because I didn’t want to fly anymore. My kids were little, so I figured I could get into real estate and that would allow me some flexibility, would allow me time to be at home. My attorney friend of mine contacted me and said that he had just gotten appointed on a divorce case. I didn’t even know what that meant, appointed to a case. Speaker 1: He explained that the court has ordered the parties to sell the house and that they’re to use me as the listing agent. That is how it all started and I recognized very early on that real estate school does not prepare us for a situation like this. My clients were extremely polarized. I had to testify in the court, had to sign on behalf of the husband in that case, sign all paperwork because he completely refused to cooperate. So I was pretty fascinated by the dynamics of it. I was a new agent and I was trying to figure out how was I going to get business. This was actually before, Zillow. This was before you really got Internet leads. My options were open houses, door knocking, expired FSBOs (For Sale By Owners), or had gone to the Brian Buffini. It was referrals and sphere of influence (SOI, COI), and those sorts of things. I pretty much have the same menu of options that most REALTOR®s had at the time. And was really drawn to this particular niche. It’s really kind of Nice to get ordered to sell a property. I remember going to early classes and realizing that the reason why REALTOR®s succeed in listings and sales is directly tied to motivation, the buyer’s or seller’s to either sell or buy and you can’t get much more motivated than the court order. What that translates to is a pretty good business model. My listings sell about 98% of the time.That’s attractive. The whole entire niche, everything from the legal aspect of it to the emotional aspect of all of was fascinating to me. So let me ask you that. What I heard is that you had the relationship first where the person that referred that basically generated the business and that’s what got you into it. Have you, since that time expanded to other attorneys giving you business or are you still getting recurring business from the attorney? Speaker 1: I’m glad you brought that up because I certainly would not want anyone listening to this call, to think that because they didn’t have a shoe in that they can’t do this. That was my introduction. I also want to be very clear that my attorney, while he was our friend, was not really a connector type. He actually did not make any other introductions for me. He’s a great guy. It was definitely what got me on that case and then I took it from there. He’s a judge now. I actually do not get referrals directly from him in an attorney capacity. What an agent who truly wants to do this as a niche needs to understand is that it is about approaching the family law community as a whole. They’re also not experts in real estate. And so they utilize on a consistent basis and have for decades and decades of child psychologists to make recommendations to the court with regards to child custody and making sort of custody arrangements. 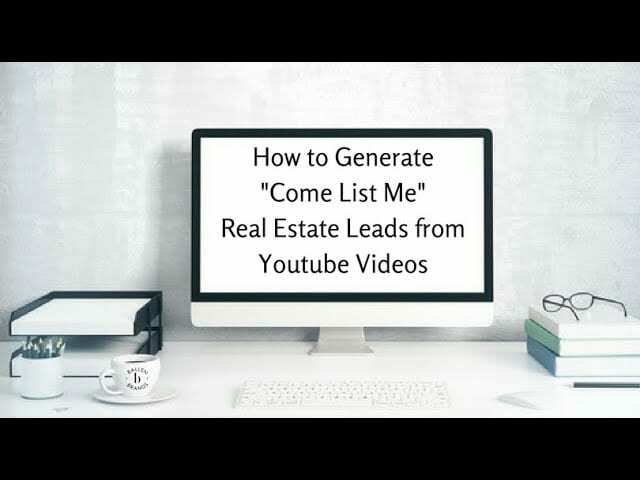 It’s not really an effective lead generation approach to go after just one attorney here and there unless you just want to have a listing here and there. But for somebody who truly wants to make this something that is a sort of an evergreen referral base, if you will, the approach is to the family law community. Speaker 2: 21:39 OK, great. And how is that done? So I’m skilled in real estate. I want to follow you, I want to do what you’re doing and want to go get in the relationships. What do I do? The reason why I believe that there has not been in real estate is that REALTORS have never shown up to it as anything, but salespeople and family law attorneys don’t like salespeople. REALTORS go to events and learn how to do sales and we think that this approach applies in this niche and it doesn’t. We have sort of cannibalized ourselves from getting past this barrier. We require useful, critical and vital skills as well as knowledge. It’s important that the approach is. It should be done in such a way that we are seen as professionals and experts and not as salespeople. The sales will come. That’s obvious. We first need to show up as a, as a professional, as an expert. We’re entering into a very different culture. Family law is their academics. They have gone to school for seven years between Undergrad and law school to obtain their law degree. Psychologists have gone to school for longer than that. CPAs have also gone to school for longer than that, or at least graduate school. So in any case, the first thing is, is, is learning and knowing you don’t jump into this without knowing how to show up. It’s a very small club that you’re going into. It is understanding that they all talk and it’s a very small community. Speaker 2: Is like the REO business here in Vegas where you have to really form relationships, wine and done and such? Speaker 1: It is very similar. My advice to someone getting into this is that the emails and the Flyers do not come before the relationship. The relationship comes first and then you can send marketing pieces again, need to be very targeted and tailored and they need to look like you’re a divorce real estate expert and they need to not just be flyers of your home sold. I mean, it needs to be data. These attorneys, they crave education and academics. We need to teach them. They say diamond as a girl’s best friend. Well, education is a lawyer’s best friend. We actually have two options there. Number one is what’s called real estate principals. Thatis really how to effectively handle a transaction. It would be ideal for someone who wants to make sure that they know how to handle the divorce listing and know that they don’t lose it because you don’t want to lose your commission. Every real estate agent should take that. And if you get a referral in the divorce niche, this course is for you. It will take about 10 hours total. It’s for the agent who wants to go all in and who truly wants to become the divorce real estate expert in their area where the court and the family law attorneys rely upon you and, and utilize your services for listing and selling properties and appointed by the court. There is an application process we do four times a year for that. It’s here in southern California. It is with our faculty. We’ve got family law attorneys, a judge, a mediator, and we have put together the most comprehensive curriculum for a REALTOR® who wants to get into this niche. We also take a field trip to divorce court and we have lunch with the judges. Then there is our community. We continue to support all of our members. Our faculty is very involved on an ongoing basis through the private group as well as through continuing education and they’re accessible. We have got a complete marketing package approach. Everything that I’ve done here to build my business here in the inland empire, that has gotten me to the top one percent of the nation. Everything that I’ve done here is made available to our, to our members step by step. Speaker 2: Let me wrap by saying one of my favorite things that you’ve done with, with doing this niches that you’ve positioned yourself in a way that these large portals can’t replace you. It makes you A linchpin instead of a cog. My name is Lori Ballen. I have a real estate team that serves Las Vegas, North Las Vegas, and Henderson, and my passion is lead generation. 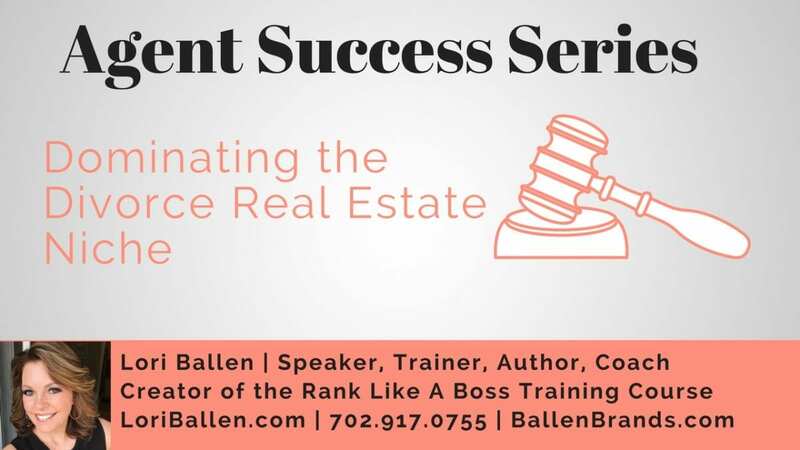 In fact, it’s such a passion that I opened a marketing company called Ballen brands where we build real estate websites. We do your blog posts manage pay-per-click services, build your CRM funnels, and more. My specialty is digital marketing, search engine optimization, pay-per-click and social media. There’s a lot of people out there that are doing some fantastic things that aren’t my niche. I’m out there interviewing real estate agents that have a specialty they can share with all of us. Today we are lucky enough to have my good friend Laurel Starks on the call today, the nation's foremost expert in the divorce real estate niche. As a veteran REALTOR®. She has completed over a hundred and $50,000,000 in sales.